EDAUtils provides a comprehensive SoC Integration Platform, named Baya, to assemble IPs defined in IP-XACT, Verilog or VHDL. 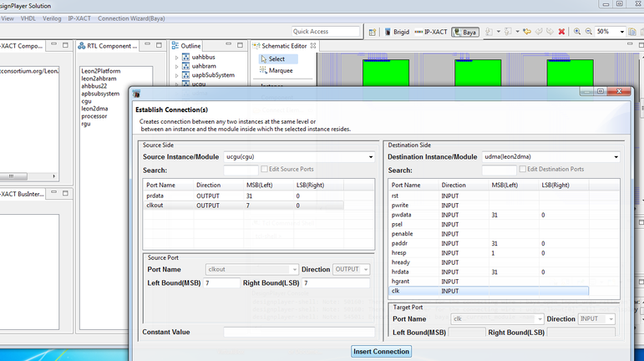 Baya offers an excellent GUI with Commands, Tool Boxes and Connection Wizard to import IPs, instantiate components and build connection among the same. Baya comes with a very rich set of Tcl commands- there are around 200 high level Tcl commands and hundreds of low level APIs for the advanced users. If you have any question concerning bug fixes, new features and enhancements, please don't hesitate to contact. You will get the best solutions at the earliest. Over the past few years, the consumer revolution has led to a convergence of applications on a single device and this trend is continuing with the growing market of smartphones where the target is enable the consumers to read e-mail, text friends, create spreadsheets and documents, watch YouTube, play video games, listen to music, take pictures, store them, get directions. To meet this growing consumer demad, today we have SoCs that contain hundreds of IP blocks and cores that can come from other departments, other divisions or even bought as commercial IP and integrating these IPs requres strong SoC Integration solution. Hierarchical view of Registers and BitFields. Easy way to capture connectivity intent.